You probably hear a lot about B vitamins, namely, that they’re vitamins that boost energy. But there’s far more to B vitamins to energy, and in this article, we’ll cover some of the highlights of each of the B vitamins to help you get a better understanding. At Natures Energy, we understand how important it is to get enough of the healthy vitamins and minerals your body needs. With our busy lives, getting these essential nutrients can be a challenge, and sometimes, we have to turn to supplements to keep our bodies performing their best. Natures Energy provides the full complement of B vitamin supplement products, including prenatal supplements, all-in-one supplements, and children’s multivitamins. Shop online for the whole family’s needs today! 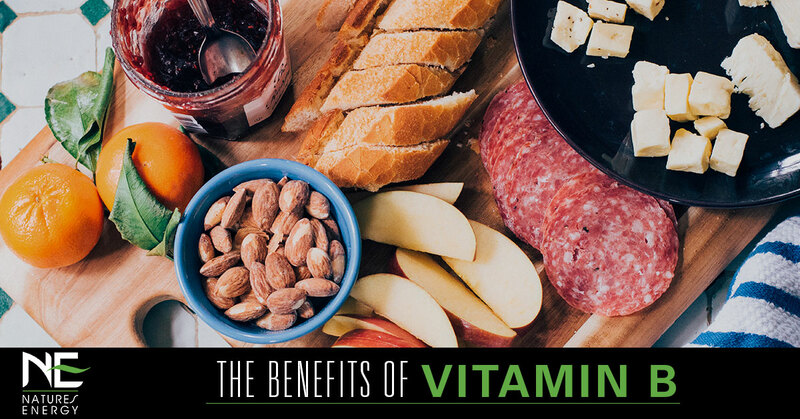 Read on to learn more about the benefits of B vitamins. When you think of vitamin B, it’s important to remember that it’s not just one vitamin—it’s a spectrum of eight vitamins that each plays an important, individual role in your body’s health. Sometimes, the B vitamins are called by different names, and we’ll cover those below. These vitamins are the only water-soluble vitamins across the board, except for vitamin C. If you have a deficiency in one of these vitamins, taking a supplement could be beneficial. Before you start taking any supplement, speak with your healthcare provider regarding dosages and potential drug interactions. Are B Supplements Safer Than Drugs? Before we continue to the following section, please note that none of this information can possibly take the place of your healthcare provider’s or pharmacist’s advice. Herbs, supplements, and other natural products can affect the efficacy of some prescription drugs, and could interact with existing health conditions you might have. If you take too much of something, you could have a negative reaction, so you’ll want to be sure to discuss the proper dosages before you start a new supplement. There are eight types of B vitamins, and each performs an essential function for your body to keep it running in tip-top shape. Below are the eight B vitamins, and the essential functions they perform. Vitamin B1 is also known as thiamine, and it helps the body produce energy by breaking down carbohydrates that you get from food. It provides support to the nervous system, and is instrumental in cell growth and function. It’s present in a number of grains, as well as white meats such as pork, tuna, and mussels. Vitamin B2 is also called riboflavin and is essential to the function of other B vitamins. It, too, converts the foods you eat into energy your body can use, and it also produces red blood cells. B2 provides support to the nervous system, as well as the eyes and skin. You can find it in dairy products, chicken, mushrooms, and almonds. Vitamin B3, also known as niacin, is another one that helps the body use the other B vitamins. B3 is essential in producing some of the hormones in the body, and helps support the skin, digestive processes, and the nervous system. It’s found in meats such as organ meats, chicken, beef, and fish, as well as dairy, eggs, and nuts. Vitamin B5 is also known as pantothenic acid, and it helps the body create hormones and use other vitamins. It is instrumental in creating cholesterol and red blood cells, and for breaking down carbs and fats to use as energy. You can find it in dark, leafy greens, as well as meats, avocados, dairy, organ meats, and legumes. Vitamin B6, otherwise known as pyridoxine, helps the body store carbs and proteins from food in the body to use as fuel. Additionally, over 100 enzyme reactions require B6 to happen, and it helps the body create hemoglobin, neurotransmitters, and hormones. It’s essential to the nervous and immune systems. Find it in liver, fatty fishes, white meats, all fruits but citrus, beef, and potatoes. Vitamin B7 is also called biotin, and you might already be familiar with its ability to help with hair, nail, and skin health. B7 helps the body produce fatty acids, and it converts macronutrients into energy for the body use. You can find it in beef and pork, egg yolks, whole grains, spinach, broccoli, sardines, and sweet potatoes. Vitamin B9, also known as folic acid, produces red blood cells, as well as the cells needed to create DNA. Pregnant women especially need B9 because it can reduce birth defects such as spina bifida and other neurological defects. You can find B9 in dark, leafy greens, asparagus, broccoli, Brussels sprouts, fatty fish, peanuts, and oranges. Vitamin B12 is also called cobalamin, and it plays a large role in metabolizing proteins. It maintains red blood cells and aids in their formation, and it also supports DNA creation. B12 supports the nervous system as well. It’s found in meats and eggs, and dairy. And because many of the B vitamins work in concert, getting enough of each one is important. Some people find that eating enough of the foods required to get B vitamins through nutrition can be difficult, so they opt for B vitamin supplements. Pregnant women should consider a prenatal supplement that’s rich in these vitamins. If you’re interested in a B vitamin supplement, vitamins to boost energy, or prenatal supplements, first discuss with your healthcare provider what your specific needs are. When you’ve learned more about what nutritional needs you have, shop for supplements online at Natures Energy! Try our Liquenergy, which is an all-in-one supplement that is rich in B vitamins. If a prenatal supplement is what you need, take a look at Prenatal Vitamins & Minerals. And if you’re a parent who is looking for a multivitamin for your kids, try Children’s Vitamins & Minerals! Shop online at Natures Energy today.